For other uses, see Police Story (disambiguation). Although it was an anthology, there were certain things that all episodes had in common; for instance, the main character in each episode was, obviously, always a police officer. The setting was always Los Angeles and the characters always worked for some branch of the LAPD. Notwithstanding the anthology format, there were some recurring characters. During the first three seasons, Scott Brady appeared in sixteen episodes as "Vinnie," a former cop who, upon retirement, had opened a bar catering to police officers, and who acted as a sort of Greek chorus during the run of the series, commenting on the characters and plots. Others who appeared more than once were Tony Lo Bianco and Don Meredith, each making five appearances as Robbery-Homicide Division partners Tony Calabrese and Bert Jameson, four of these appearances being in the same episodes; Vic Morrow played surveillance specialist Joe LaFrieda in the pilot, "Slow Boy," and in the first season two-part episode, "Countdown." Vice officer turned homicide detective Charlie Czonka was played by James Farentino in two episodes; and John Bennett Perry played Officer Chick Torpey five times during the first two seasons, including the pilot film. Chuck Connors and Jackie Cooper also starred in various episodes, as different characters on both sides of the law. The anthology format allowed the series to depict a wider variety of police activities and experiences than was usual in police dramas. In addition to detectives investigating major crimes, or patrol officers patrolling high crime beats, the show depicted newly hired cadets trying to make it through the academy, woman officers trying to fit into a male-dominated profession, traffic officers investigating accidents, officers dealing with marital difficulties or alcohol dependence, fingerprint techs trying to develop suspects from a single print, high-ranking administrators dealing with the stresses of command in a major metropolitan police force, officers adjusting to permanent physical disabilities caused by on-duty injuries, and officers trying to juggle two different jobs to make enough money to support their families. 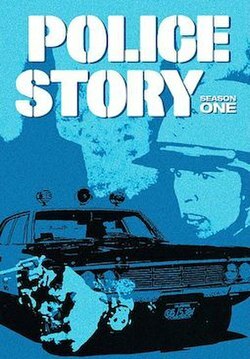 The anthology format also allowed the show to try out characters and settings for series development, and, during its broadcast run, Police Story generated three spin-offs. A first-season episode, "The Gamble," starring Angie Dickinson, became the pilot for the successful Police Woman, which ran from 1974 to 1978. "The Return of Joe Forrester," a second-season episode starring Lloyd Bridges, was developed into the weekly series Joe Forrester, which lasted a full season. Finally, "A Chance to Live," a special episode from the fifth season starring David Cassidy, was spun off into the series Man Undercover. That series didn't do as well, and lasted only ten episodes. In later seasons, perhaps because of the expense of maintaining the anthology format on a weekly basis, Police Story became a series of irregularly scheduled TV movies. Two episodes received an Edgar Award from the Mystery Writers of America for Best Episode in a Television Series: "Requiem for an Informer," written by Sy Salkowitz (from the first season), and "Requiem for C.Z. Smith," by Robert L. Collins (second season). In 1976, the show won the Primetime Emmy Award for Outstanding Drama Series. Shout! Factory (under license from Sony Pictures) has released the first three seasons of Police Story on DVD in Region 1. In 1988, ABC aired four Police Story TV films using scripts from the original run to fill in for the ABC Mystery Movie, then delayed by the writers' strike. The stars of the films included Ken Olin, Robert Conrad, Lindsay Wagner, and Jack Warden. ^ "Police Story - What's 3 More Weeks? Slight Delay for 'Season 2' DVDs". Archived from the original on 2017-08-01. Wikimedia Commons has media related to Police Story (TV series).